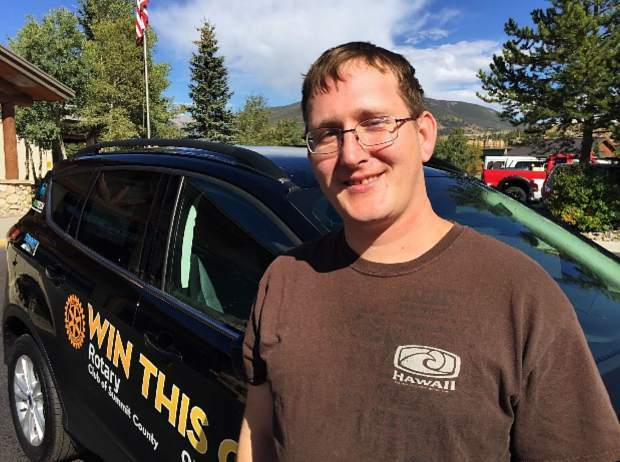 Jon Estes of Dillon won a new car this month as part of the annual Summit County Rotary Club car raffle. Jon Estes of Dillon was announced recently as the winner of the Summit County Rotary Club’s annual car raffle. The prize was a 2018 Ford Escape from Summit Ford or a new option this year — $20,000 in cash. The winning ticket was drawn on the main stage at Breckenridge Oktoberfest on Sep. 8. Estes, 35, has been living in Summit for 33 years and currently works at the Dillon City Market. His current car is an ‘01 Jeep Cherokee with 114,000 miles on. The annual Car Raffle and Ice Melt Contest are the major fundraisers for the many projects supported by the Rotary Club of Summit County, including: free weekly community dinners in Silverthorne, ​free Thanksgiving dinners, ​Community Care Clinic, ​9 Health Fair, free dictionaries for all 3rd graders, middle school literacy contests and ethical decision-making training, international youth exchange programs, college scholarships, youth leadership training, and many others. Raffle tickets were sold to the public by the combined efforts of club members on weekends at the Dillon Farmers’ Market, 4th of July parade, Dillon and Breckenridge City Markets, the Frisco BBQ Challenge, NRO Concerts and Walmart. Tickets were also available online. Sales ended when the last of the 8,500 tickets was sold on Sept. 8. For more information on the Rotary Club of Summit County go to http://www.summitrotary.com or follow them on Facebook.